Squadron Leader E D "Rosie" Mackie, Commanding Officer of No. 92 Squadron RAF, photographed at Canne, Italy, when his score of victories stood at 15 confirmed enemy aircraft destroyed. Mackie joined the RNZAF in 1941 and arrived in the United Kingdom in 1942 where, after a period at an Operational Training Unit he was posted to No, 485 Squadron RNZAF. Early in 1943 he joined No. 243 Squadron RAF in North Africa, and achieved considerable success, becoming a flight commander in May and commanding the squadron itself in June. 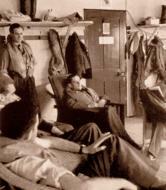 In November 1943, after further victories over Sicily and Italy he was given the command of 92 Squadron RAF. Mackie's long tour of operations ended on 20 February 1944, after which he returned to the United Kingdom and converted to flying the Hawker Tempest. In December 1944 he joined No. 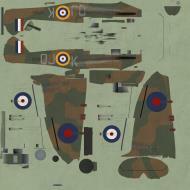 274 Squadron RAF in Holland, but was made Commanding Officer of No. 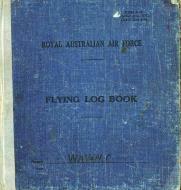 80 Squadron RAF the following month, and then promoted Wing Leader of No. 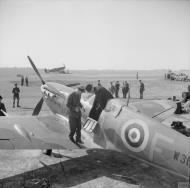 122 Wing RAF in April 1945, before returning to New Zealand the following September. Lieutenant A Sachs SAAF seconded to No. 92 Squadron RAF, sitting on his Supermarine Spitfire Mark VIII at Canne, Italy. On 5 December 1943 Sachs scored the 99th and 100th victories for his Squadron when he shot down two Focke Wulf Fw 190s near Pescara, before colliding with a third Fw 190 and being forced to bale out. After a period as a flying instructor in the United Kingdom, he returned to Italy to command No. 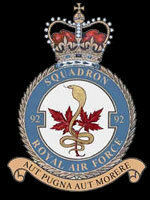 93 Squadron RAF from September 1944 to February 1945. A Supermarine Spitfire HF Mark VIII of No. 92 Squadron RAF, undergoing routine maintenance at Grottaglie, Italy, is refuelled from a Bedford QL fuel tender. Spitfire Mark VB, R6923 QJ-S, of No 92 Squadron RAF based at Biggin Hill, Kent, banking towards the photographing aircraft. R6923 was originally a Mark I, converted to a Mark V after serving with No. 19 Squadron and No. 7 Operational Training Unit in 1940. It was shot down over the sea by a Messerschmitt Bf 109 on 22 June 1941. Ground crew running up the engine of a Supermarine Spitfire Mark VIII of No. 92 Squadron RAF at Triolo landing ground, south of San Severo, Italy, prior to an early morning patrol. Note the airman sitting on the tailplane to hold the rear of the aircraft down during the run-up. A Supermarine Spitfire HF Mark VIII of No. 92 Squadron RAF undergoes servicing in a farmyard by the landing ground at Triolo landing ground, south of San Severo, Italy. A pilot of No. 92 Squadron RAF climbs into the cockpit of his Supermarine Spitfire Mark VIII at sunrise, for a morning patrol from Triolo landing ground, south of San Severo, Italy. The Prime Minister of New Zealand, the Rt Hon Peter Frazer, climbs from the cockpit of a No 92 Squadron Spitfire VB at Biggin Hill on the evening of 11 July 1941, during his whistle-stop tour of South Eastern Command. Squadron Leader R M Milne, the Commanding Officer of No. 92 Squadron RAF, sitting in the cockpit of his Supermarine Spitfire Mark VB, "New Yorklin", at Digby, Lincolnshire. His victory tally shows 11 enemy aircraft shot down. He was posted to command No. 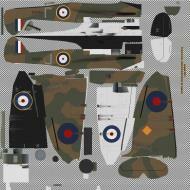 222 Squadron RAF in January 1942 and, one year later, became wing leader at Biggin Hill. On 20 January 1943 he shot down two Focke Wulf Fw 190s, but was then shot down himself, becoming a prisoner-of-war. The Battle of Britain, which raged in the skies over Southern England between 10th July and 31st October 1940, was a dramatic turning point in the history of the Second World War and a defining moment in World history. During these crucial weeks some 2,900 RAF aircrew took part in an historic battle against the German Luftwaffe that was to become the only battle ever to be fought entirely in the air. The Allied fighter pilots involved in the Battle were to become known as “The Few” after Prime Minister Winston Churchill made his famous speech on 20th August 1940 in which he said, “Never in the field of human conflict was so much owed by so many to so few”. The RAF fighter pilots were supported by an amazing diversity of people on the ground, in and out of uniform, whose efforts and skills, courage and determination allowed the country to fight off a sustained assault by a numerically superior enemy determined to overthrow not just the British Isles but free and democratic processes everywhere. Victory in the Battle was won against incredible odds and was based on inspired technology, indomitable group spirit and great individual courage and heroism. The Battle of Britain turned the tide of World War Two in the Allies’ favour but the cost was high. Almost 550 RAF aircrew lost their lives; many others were seriously injured. In addition, 23,000 British civilians were killed. The Luftwaffe lost around 1,700 aircraft and an estimated 2,600 aircrew. The Battle of Britain Memorial Flight’s Spitfire Mk IIa, P7350, the oldest airworthy Spitfire in the world and the only one still flying that actually fought in the Battle of Britain, has been repainted to represent a Spitfire which was flown by a survivor of ‘The Few’. Geoffrey Wellum was one of the youngest fighter pilots to participate in the Battle and he did so with one of the RAF’s most famous fighter squadrons, No 92 Squadron, a unit that won renown throughout Fighter Command for its panache and vigour. No 92 Squadron was formed towards the end of the First World War, on 1st September 1917, as a fighter unit, moving to France and into action in July 1918. It was engaged in fighter and ground attack duties over the Western Front for the rest of the war, flying the SE5a, and being heavily involved in the Somme offensive of 1918. The Squadron was disbanded in 1919. On 10th October 1939, No 92 Squadron was reformed at Tangmere from a nucleus of Auxiliary Air Force and Volunteer Reserve pilots, initially being equipped with Blenheim 1F aircraft. In March 1940, whilst the squadron was based at Croydon, it was re-equipped with Spitfire Mk1s and the Squadron became operational as a fighter unit on 9th May 1940, moving to Northolt. The Squadron’s pilots were a cosmopolitan bunch, with 2 Canadians, a New Zealander, a South African and an Irishman amongst their numbers; and, as was normal on squadrons at that time, some several of its pilots were NCOs. 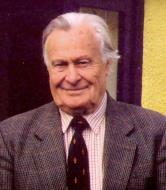 Geoffrey Wellum was born in Walthamstow on 4th August 1921. He joined the RAF straight from school, aged only 17, reporting for duty on 28th July 1939, a few weeks before war was declared. Having completed his ab-initio pilot training on DH82 Tiger Moths and his advanced pilot training on Harvards, he was posted to No 92 Squadron at Northolt, arriving on 22nd May 1940 along with another young Acting Pilot Officer straight out of training, Trevor (‘Wimpey’) Wade. Geoffrey had a grand total of 168 hours flying training behind him (95 hours solo) and was still only 18 years and 9 months old. He had never even seen a Spitfire close up, let alone flown one! Perhaps not surprisingly the Squadron Commander, Squadron Leader Roger Bushell, was not particularly pleased to see the new arrivals. (Bushell later became famous as the leader of the Great Escape from StalagLuft III POW camp, after which he was executed by the Gestapo). The Squadron was about to fly its first operational sorties and had no time, capacity or inclination to risk its precious Spitfires training new ‘sprogs’. Indeed, the day after Geoffrey Wellum’s arrival, 92 Squadron went into action for the first time since the First World War, moving to Hornchurch and flying patrols over Dunkirk as the embattled British Expeditionary Force withdrew from France and escaped across the Dover Straits. By the end of the Squadron’s first day of fierce fighting on 23rd May 1940, 6 of its 16 pilots had been lost, 2 of them killed over France, 2 taken prisoner or war (including the CO, Roger Bushell) and 2 seriously wounded - the cost for the 16 enemy aircraft claimed by the Squadron. The next day they lost a further pilot shot down over France and taken prisoner. Geoffrey says that he will never forget the sight of the Squadron’s pilots as they came back into the Officers Mess that evening after 2 days of hard fighting. Most of them had been over Dunkirk 3 times that day and it was a day of the very fiercest fighting. They were no longer young men with hardly a care in the world but older, mature men who now knew fear and what it took to conquer it, not once but time after time. He knew that this test was still to come for him. He wondered whether he would have what it took to prove to himself and the others that he was not a coward; history shows he did. No 92 Squadron was sent to Duxford to draw breath and regroup and it was here that Geoffrey Wellum made his first flight in a Spitfire, a Spitfire wearing the markings ‘QJ-K’, which inevitably resulted, inevitably, as he says in, “that graceful, sleek and almost delicate lady, the Spitfire, becoming forever my first love”. The Squadron returned to the action over Dunkirk at the end of May and into June, achieving significant success and without further loss (except for a freak accident to the replacement CO, Squadron Leader Saunders who burned himself badly after cleaning oil from his uniform with petrol and then lighting a cigarette). Geoffrey, though, was not yet ready for operational flying and did not fly on these patrols. I n June 1940 the Squadron was suddenly sent on a ‘rest tour’ to Pembrey in South Wales, where it remained for 3 months, “a decimated, bloodied but unbowed squadron, pulled out of the front line to lick its wounds and reform its ranks”. 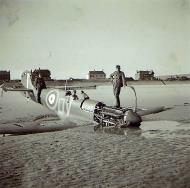 This enforced period of additional training for Geoffrey before he was flung into combat may well have been the saving of him as he had time to fully familiarise himself with flying the Spitfire and with operational tactics, although many other slices of luck also played their part in his survival. Indeed, he was fortunate to survive, unscathed, a bad landing accident that wrecked his Spitfire whilst night flying at Pembrey. On 9th September 1940, No 92 Squadron, with Geoffrey Wellum now operational, was moved back to 11 Group, to Biggin Hill, one of the most famous Fighter Stations, and to the Sector that experienced the most ferocious fighting during the Battle of Britain. Although they were entering the fray towards the end of the Battle, by December 1940, No 92 Squadron would claim 127 enemy aircraft destroyed. Geoffrey Wellum’s first combat occurred on 11th September 1940, just over a month after his 18th birthday, a day when the Luftwaffe launched 3 large raids on the South-East of England and London, Portsmouth and Southampton were all attacked. During the day a major raid of some 250 enemy aircraft headed towards the Kent Coast and inland towards Central London through the Biggin Hill Sector. Flying Spitfire Mk 1a K9998, coded ‘QJ-K’, Geoffrey was part of a squadron scramble from Biggin Hill, launched against this incoming raid. He flew as wingman to Flight Lieutenant Brian Kingcome, 92 Squadron’s acting CO (the Squadron lost 2 new COs within days of their arrival and Brian Kingcome led the Squadron temporarily in the absence of a squadron commander). When they saw the enemy formation it looked like a swarm of gnats on a warm summer evening, hundreds of Dornier and Heinkel III bombers with Bf 109 fighter escorts intent on attacking England, a frightening but fascinating spectacle. The Spitfire pilots widened their formation and tore into a head-on attack against the lower layer of Dornier 215 bombers. Geoffrey was sure he had scored hits against one and narrowly avoided a collision with it as he broke away. Now he had to fight his way through the 109s to get back to the bomber formation, firing at one and breaking hard away from another that was shooting at him. Then Geoffrey spotted a lone Heinkel III bomber way below and going fast between him and the coast, heading towards Dungeness. With his height and speed advantage he quickly caught up with the German bomber and set up a quarter attack. Ignoring the return fire from the bomber’s gunners, his saw his own rounds striking the Heinkel, especially the port engine, which started to smoke. As he broke away under the bomber, 3 holes appeared in his port wing - some of the return fire was a little too close for comfort. Another quarter-to-stern attack from the starboard side of the bomber achieved more hits and the return fire from the gunner stopped. Eventually he had fired out all of his 15 seconds of ammunition and he could only watch as the Heinkel lost height fast and very definitely on fire. Then suddenly his own aircraft was hit by cannon fire - frightening noises and explosions behind him. He had been ‘bounced’ by an unseen Bf 109 whilst he was concentrating for too long on ‘his’ bomber target and now he had no ammunition left with which to fight back. He broke hard into the tightest turn possible and commenced a fight for his life. Eventually, after a very hard-turning and frightening dogfight against a determined and skilful German 109 pilot, Geoffrey managed to escape and raced back to Biggin Hill where he landed with several holes in the port wing and rear of the aircraft. He felt that he could justify claiming the Heinkel as a kill in his combat report. That was the last time that Geoffrey flew in Spitfire K9998 which was clearly in need of some substantial repairs. 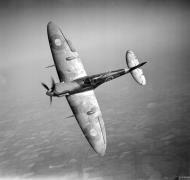 He was given another Spitfire coded ‘QJ-G’ that afternoon and this became his aircraft for the remainder of the Battle. Some people only recognise after the event, that they have taken part in a great moment of history. But the young British pilots of 1940, including Geoffrey Wellum, were in no doubt, each time they took off, that they were dominating the stage at one of the decisive moments of their nation’s fortunes. 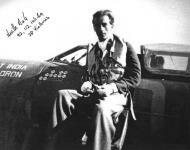 Geoffrey Wellum flew throughout the remainder of the Battle of Britain and later completed over 50 fighter sweeps and escorts over northern France and Belgium, surviving in Fighter Command until August 1941, unlike many of his comrades who paid the ultimate price. In March 1942 Geoffrey joined No 65 Squadron as a Flight Commander operating on fighter sweeps over Northern France. Subsequently, in August 1942, he led 8 Spitfires off the aircraft carrier HMS Furious to reinforce the beleaguered island of Malta. Geoffrey was officially credited with three enemy aircraft destroyed, four probables and several damaged; he was awarded the DFC in July 1941. Against this there were the deep physical and mental effects which combat made upon every man who experienced it. After arriving in Malta in 1942 Geoffrey suffered severe combat fatigue resulting in emotional and physical breakdown and to use modern parlance he was ‘casevaced’ home, “played out mentally and physically”. He was just 20 years old. He recovered though, to become a test pilot at Glosters, testing Typhoons and then became a gunnery instructor, staying on in the in the RAF after the war until 1961. He is now known world-wide after the publication of his widely-acclaimed and beautifully written book ‘First Light’, a memoir of his wartime experiences, which was first published in 2002 and which became a best-seller. Geoffrey now rejoices in his experience, even though fear and exhaustion corroded him at the time. “It was strange and wonderful, and I feel a great content. Only men who fly will understand” he says. The BBMF is proud to commemorate Geoffrey’s story with the new colour scheme on Spitfire P7350, now painted as 92 Squadron’s ‘QJ-K’, the aircraft in which Geoffrey gained his first aerial victory during the Battle of Britain. He was just one of the many fighter pilots who played their part but what a vital part and at such a young age. All of them deserve our unstinting gratitude.